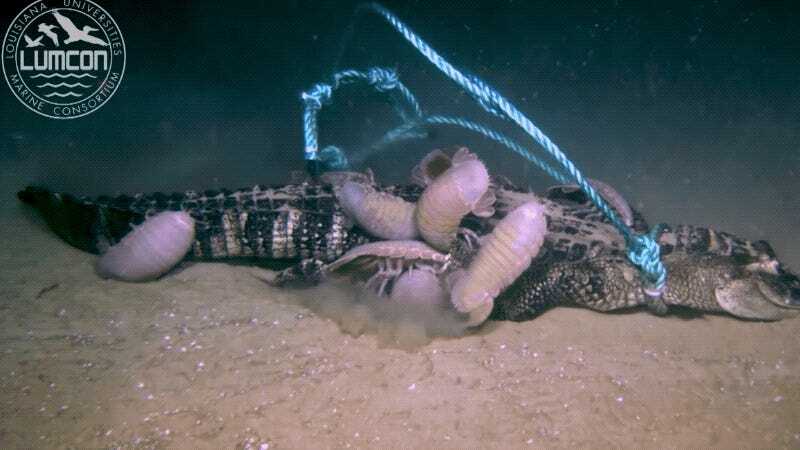 Within hours, giant isopods had descended upon the dead alligator. Astounding new video taken at a depth of 2,000 meters (6,650 feet) by a remotely operated vehicle (ROV) in the Gulf of Mexico shows giant deep-sea isopods not wasting any time when an unexpected meal presented itself—in this case, a meal that doesn’t typically appear on the menu. 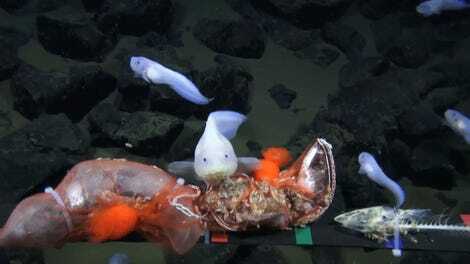 The researchers responsible for the grim experiment, a team led by Craig McClain and Clifton Nunnally from the Louisiana University Marine Consortium (LUMCON), were studying how material from terrestrial environments enrich food webs in deep-ocean environments. In this case, the terrestrial material was three dead alligators, which didn’t seem to bother the giant isopods one bit. They quickly pounced, appearing at the site less than 24 hours after the gators arrived. These crustaceans are distantly related to pill bugs, also known as roly-polys, but they’re roughly the size of footballs. Using their powerful mandibles, the creatures tore away at the flesh, gorging on the alligator meat until they could barely move. The enthusiasm of these scavengers is totally understandable. Deep-sea bottom feeders are immensely dependent upon “food falls,” in which deceased aquatic animals from above settle on the ocean floor. This typically involves whales, dolphins, sea lions, and large fish like tuna, sharks, and rays, but it can also involve stuff from the land, such as plant material, wood, and, as the new video shows, alligators dropped by scientists. The video was captured this past February, and it marks the first time that scientists have used reptile carcasses to “to examine the role of alligators in biodiversity and carbon cycling in the deep oceans,” explained McClain in Deep Sea News. Both live individuals and carcasses of alligators are frequent on beaches and in coastal surf. A 3-meter [10 foot] individual came ashore at Folly Beach, South Carolina in 2014 and in 2016 a carcass of a 4-meter [13 foot] individual washed up on a beach in Galveston, Texas. [Alligators] may be easily carried offshore by major rivers or during large storm events, tropical storms, and hurricanes. Live A. mississippiensis [a species of alligator] have been observed 30 kilometers [18.6 miles] offshore and after Hurricane Katrina in 2005, an alligator was found 25 kilometers [15.5 miles] offshore. During the 2011 Mississippi flood event, several dead alligators were observed in the mouth of Atchafalaya River. For the experiment, McClain and Nunnally acquired three alligators recently culled by the State of Louisiana. The gators measured between 2 and 2.5 meters in length (6.5 to 8.2 feet), and were placed at three different locations in the Gulf of Mexico at depths approaching one and a half miles. Video taken by the ROV shows how quickly the isopods detected and descended upon the alligator carcasses. The creatures pinched and tore away at the tough alligator hide with their specialized mandibles. Large gashes eventually appeared on the gators, exposing the ribs. In one case, a pair of giant isopods crawled into an alligator, eating the reptile from the inside. The crustaceans ate to the point of stupefaction. As the researchers pointed out in the video, these creatures have an amazing ability to gorge themselves and store the accumulated energy. After a meal like this, the giant isopods won’t have to feed for months—and possibly even years. The researchers will return to the alligator carcasses in a couple of months to see what’s left. As the flesh gets progressively eaten away, the animals who feast on the dead beast will get progressively smaller. Accordingly, McClain and Nunnally are expecting to see brittle stars and tiny fish picking away at what’s left. They’d also like to collect some ribs to determine if bone-eating worms are present—a scavenger never seen before in this part of the world. 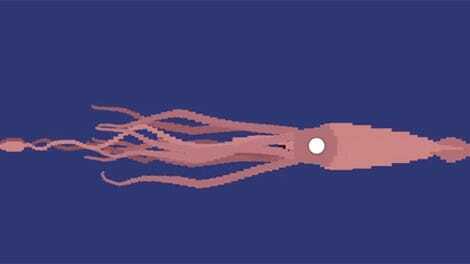 What Kind of Scary Creatures Are Hiding Deep in the Ocean?